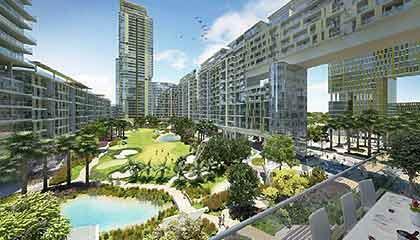 Standing over 75 acre of prime lands on the Golf Course Extension Road in Sector 65 of Gurgaon, M3M Golf Estate offers supremely luxurious condominiums over six 65 storey iconic towers, the tallest in Northern India. With a stunning 110% of the total land left for greens & concrete development only on 15% of the land this premium Delhi property promises the best of environments for a healthy life. Units on offer are spacious 3 & 4 bedroom apartments spanning 3605 to 4770 sft along with some duplex units as well. The units come with out of the world specifications like central AC, marble & wooden floors, 5 fixture toilet with imported fittings, modular kitchen with hob, chimney, refrigerator, microwave, dish-washer, etc. Amenities are a galore at the M3M Golf Estate. Besides the 9 hole Executive Golf Course, it also features swimming pool, tennis court and jogging tracks, adventure play zone, restaurant, Video game room, Mini theatre, etc. The 100000 sft club comes with lounge, Billiards room multipurpose hall/functions Lounge, yoga/Dance class room, Table tennis room, Squash court, etc. It also hosts a Health club facility with fully equipped unisex gym fitted with cable TV's, Jacuzzi, Dance and aerobic studio. Other facilities include Kids creche, Massage Therapy room, Convenient shopping, Doctor on call, Concierge on call, Young kids club and more. Located on the proposed metro corridor, the M3M Golf Estate is close to major schools like Heritage, Scottish High, G.D. Goenka, etc and so are hospitals like Max, Artemis, Medicity, Fortis etc. It also stands near entertainment destinations and plazas like Metropolitan, Mega mall, DT City Centre, Sahara, etc and major firms like Hughes, Amex, Hewitt, E & Y, IBM, etc.